Please click to enlarge images. This book has 16 paintable surfaces. 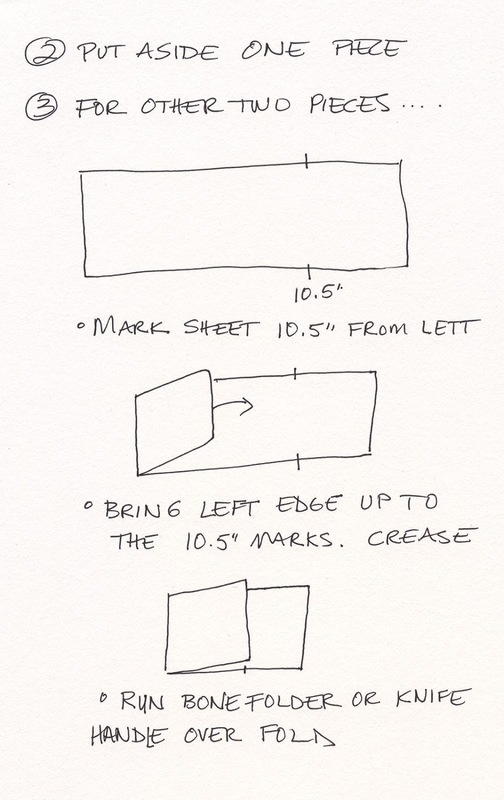 You'll want to use Fabriano watercolor paper as it doesn't crack when folded. I tore my sheets so I could get an uneven edge. I use their hot press surface as I like writing on the smooth surface. 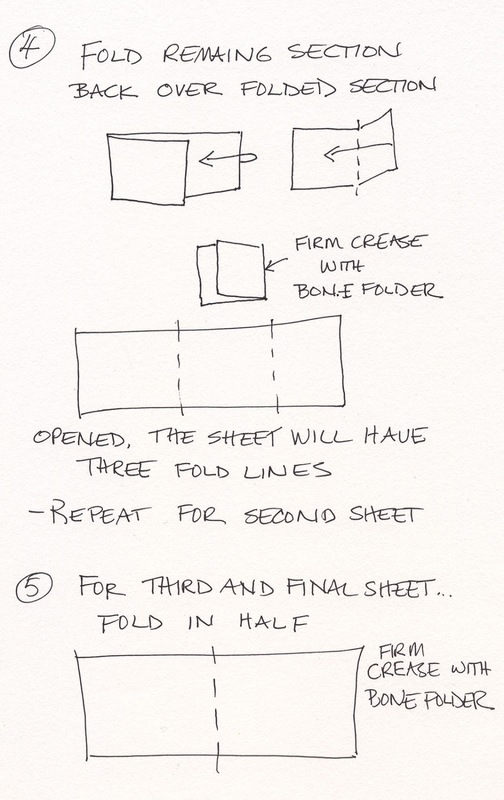 Your book will be as precise as your folds. Take your time and you'll be happy. I practiced on a 15" x 22" sheet of drawing paper. I'm glad I did! No charge for type-os :) If anything doesn't make sense to you, leave a comment and I will try to answer your question(s). This is a very helpful post, thank you! Are you using 90 lb or 140 lb hot press paper? 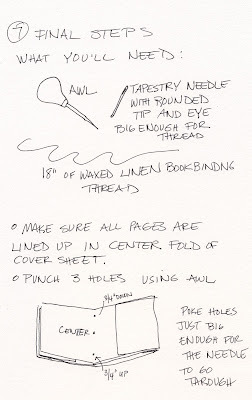 I am new to book-binding (I have only bound one coptic-bound journal using Strathmore 400 CP paper, and a couple single-signature journals with Strathmore Aquarius II), but in researching how to do it I found some information on Roz Stendahl's blog that I found helpful. One particular post (http://rozwoundup.typepad.com/roz_wound_up/tearing-down-fabriano-art.html) talks about Fabriano paper and how these days the grain runs parallel to the 22" side (which is actually a relatively recent change; it used to run along the 30" direction). I guess this is important in that the fold needs to be with the grain, not against it. 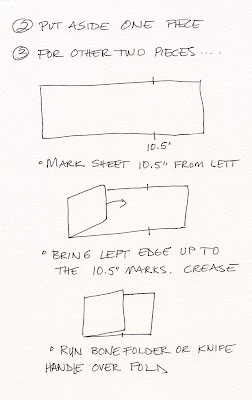 So there is another reason your readers should use Fabriano paper for your journal design, because the folds as you have them are with the grain. 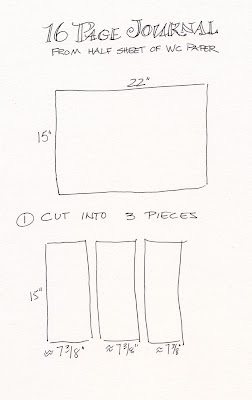 However, my experience with Strathmore paper is that the grain is parallel to the 30" side (opposite Fabriano). 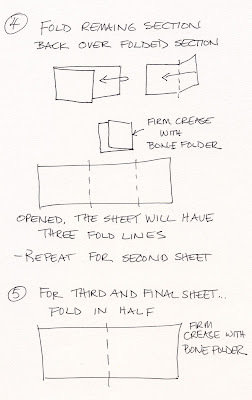 So using Strathmore paper for your journal would result in folds that are against the grain. Roz's post was specifically pertaining to Fabriano 140lb CP and at the time she wrote it she didn't know if the change in paper would extend to HP. I guess it has? Hi Stacy! Thanks for stopping by! 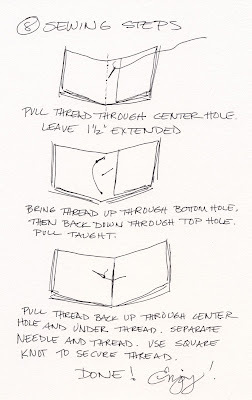 I love Roz's posts and have the one mentioned above safely tucked in my how-to file. 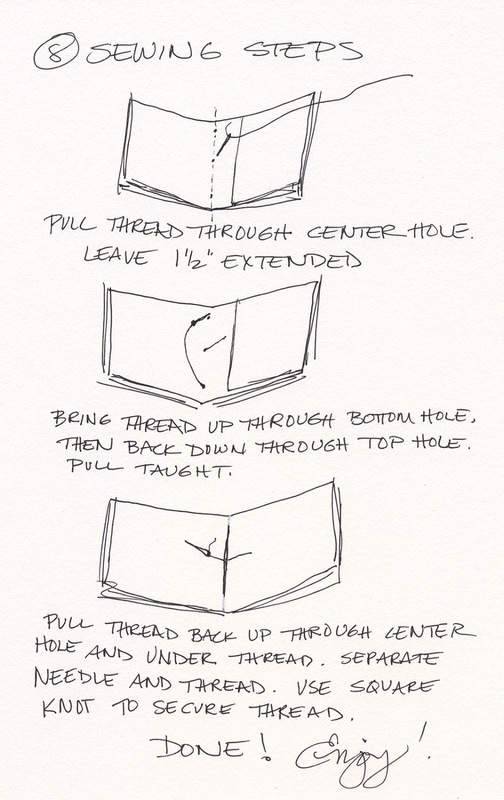 I'm relatively new to book-binding, too. I use 140# HP. I find Fabriano's HP surface more forgiving than Arhces'. And, when I tear down sheets for my normal journal, I am working with the grain. 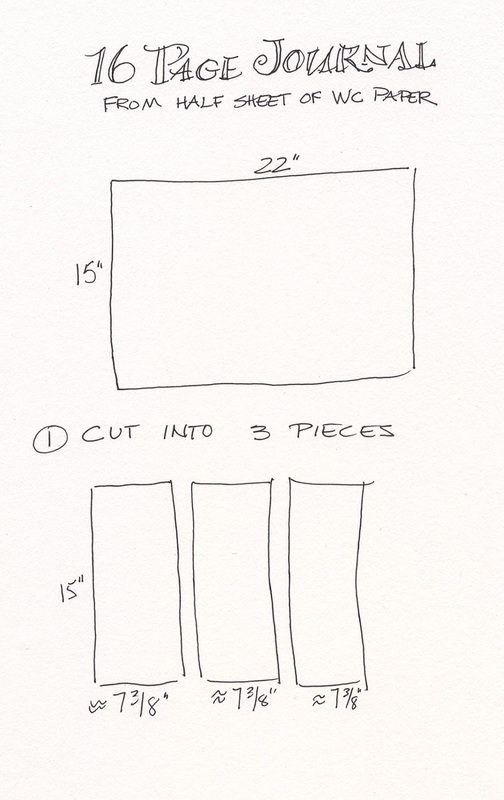 I tear down to make 8 (7.5 x 11) sheets that I then fold in half. I write a lot on my pages and find CP too rough. Fabriano's soft press is better for me than CP but still I prefer their HP best. Hope this helps! wow! 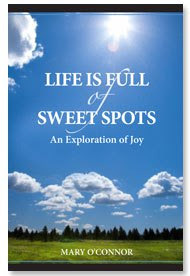 so nice to have discovered this, what an inspiration! Thanks, Sarah! 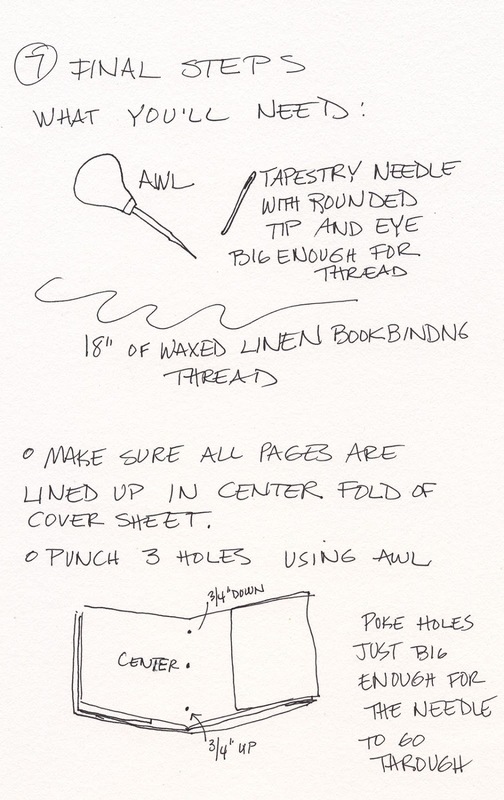 You can make this same type of booklet using an entire sheet of wc paper, too :) Happy building/sketching/painting!